The "Rainbow Lights the Dark" series was created a week after the Orlando nightclub shooting. 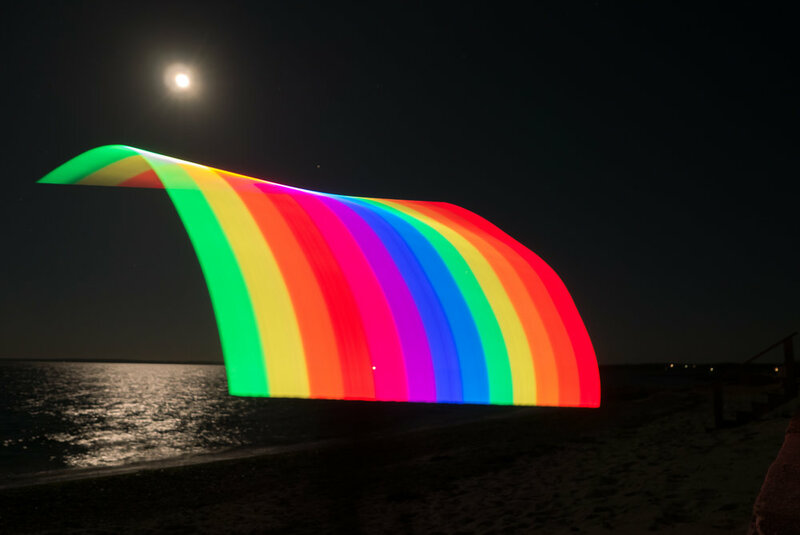 The beauty of the full moon and the Cape Cod beach reminded me as I swirled the rainbow lights, that the victims, so many young lives, will never enjoy another full moon, or a beach, or the joy of creating and sharing their vision with the world. Each time I look through these photos I'm stricken with grief, and hope that we all can wave our rainbow in unity and pride. With my SLR, tripod, iPhone and LEDs, I create in camera paintings by controlling the amount of light that hits the sensor. The process is physical and immediate, yet I don't know exactly what I've created until I view playback on my camera. It's understanding what my camera has captured that guides me next time around. My Nikon was stable on the wall to the beach. I used the flashlight app on my iPhone set to TRIPPY which rotated colors as I created the swilling pattern. I could have stayed out there all night making these light paintings. Above is a time-lapse of a light painting session I did on a Cape Cod beach in Summer 2015. I edited it to include music and to create a dance partner, I made a double version of myself by duplicating the video layer and shifting the timing slightly. I decided to tape the lights to my body in response to an unfortunate incident I had weeks earlier -- While swinging a hard plastic LED above my head, at quite a clip, I hit myself in the temple. Instead of spending the night on the beach as I had hoped, I spent it in the ER. I received 4 stitches and many confused looks when explaining how I cut open my face. Art can be a dangerous venture, but even though I'm not happy that I now have a scar above my eyebrow, I do believe every step in the making of art leads to new grounds. By taking new precautions, this video was born. 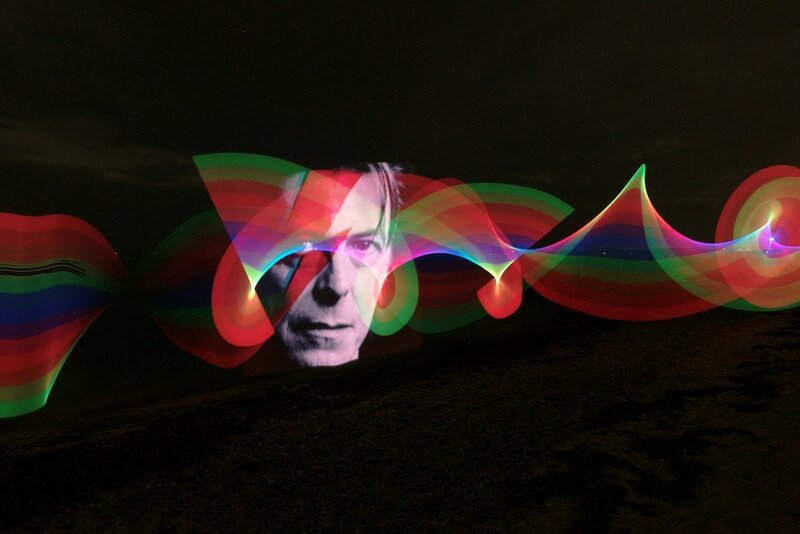 What amazes me about the light paintings is the act of the shot is visually fleeting and highly kinetic. It's rewarding and a joy to see the results when I play back the frame. This .gif is a compilation of three shots taken in my favorite Puritan cemetery. It seemed a lot darker at the time, but the 30 second exposure let in a lot of light illuminating the lake in the background. This is a stop motion (Vine) animation of the posters rescued from the Boston Women's March for America that took place in Boston on 1/21/17. Many posters were left at the end of the march route in a make shift memorial in Boston Public Gardens. At nightfall the public works department was about to load them into a dump truck for destruction when members of Northeastern University, College of Arts, Media and Design (NECAMD) happened to witness the situation at hand -- a visual piece of a historic day in Boston was about to meet it's demise - and took action. They rented a van, collected the posters and stored away. After securing a warehouse for 2 days, volunteers were gathered where the art work from the march was placed on the floor, photographed from above, individually photographed on copy-stands, then archived under the supervision of Northeastern University Snell Library. The soundtrack is several layers of natural sound form Boston Women's March for America 1/21/17. A Nam June Paik exhibit at the Centre Pompidou, Paris during my year abroad validated video as an art form, as well as a tool and medium in the creation of art. An art instructor assigned a self portrait. Here I incorporated the iPhoto face recognition software as a video source. I placed plastic over the computer screen and painted onto the surface. I used screen shots of the video as elements in a mixed media on canvas painting. One of the first films I studied in school was the 1929 Un Chien Andalou by the Spanish director Luis Buñuel and artist Salvador Dalí. After that initial viewing, my perception of filmmaking and eyeballs shifted forever. With the use of several iPhone apps, I created this Instagram post within minutes. This piece was in reaction to an interview with Dr. Lustig siting the detrimental relationship we have as a nation with sugar. In the documentary "Fed Up", he sums it up in three words: "Sugar is poison." The title of this video piece , Ab Ovo: The Haptic Start, 2014, refers to the duality and condition of our species, the environment, and our exponential growing relationship and interaction with technology. Both Ab Ovo, the painting and Ab Ovo: The Haptic Start, the video, will be integrated into my future experiential installation.